Each time a cell divides, it replicates its DNA once, then separates the two copies from each other and splits into two daughter cells. The event is intricately coordinated and was long known to be under the influence of cyclins—an aptly named group of proteins whose levels go up and down as the cell traverses through the different phases of its division cycle. Stop the clock: Yeast cells that lack cyclin activity cannot divide or make waves of new protein. The cells shown here, in which cell cycle start was experimentally induced, only make the first set of “start” proteins (yellow) but do not progress through the cell cycle. This picture of the cell cycle came into question in 2008, when a study done in yeast suggested that individual steps of the cycle might not be dependent on cyclins, but rather be driven by oscillations in gene expression. 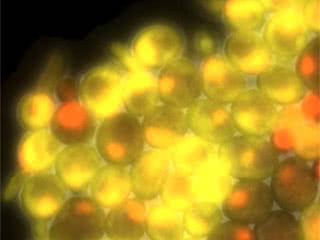 Now, work from Rockefeller’s Laboratory of Cell Cycle Genetics, led by Fred Cross, puts cyclins squarely back at the helm of cell cycle–regulated gene expression by showing that if these proteins are completely and totally eliminated, yeast cells no longer have pulses of periodic gene expression, and completely fail to execute the cell division cycle. The results are reported in Cell. Sahand Jamal Rahi, a postdoc in the Cross lab who is the first author of the paper, likens the cell passaging through its division cycle to a factory making a complicated product, like a car. Only in this case, the cell is remaking itself. “Everything must happen in a particular order to make sure the finished product comes out properly,” he says. First the various cellular structures must be duplicated, then DNA must be copied and acquire the appropriate scaffolding, and only then can the cell finally split in two. These events must happen in a coordinated manner, each in its designated time. “The question is,” says Rahi, “is there a central clock in the middle of the factory floor that lets everyone know when to do their jobs, or does every worker have her own watch?” In this analogy, the idea that cyclins regulate the cell cycle is akin to the central clock, whereas the contending theory, according to which protein production can run independently, would be more like the multiple factory workers carrying their own watches. In the study, Rahi generated strains of yeast that did not produce cyclins and whose cyclin-dependent kinases—a family of enzymes that are activated by cyclins—are inactive. He found that these strains did not undergo the timely oscillation of gene expression that is normally seen in yeast cells as they move through the cell division cycle. This proves that cyclin expression, and not global oscillations in gene expression, really is essential for moving the cell cycle forward. In other words, there is a central clock in the middle of the factory. These questions are not only interesting for basic scientists trying to understand the mechanics of cell division; they may be clinically relevant as well. A family of drugs that target cyclin-dependent kinases are currently being tested in clinical trials for different types of cancers. A better understanding of the mechanisms by which cyclins control the cell cycle might yield some insight into what these drugs are doing in cells, and how well they can be expected to work as cancer drugs. This work was supported by the National Institutes of Health under grants 5RO1-GM078153-07 and CA009673-36A1, and by postdoctoral fellowships from Merck and the Simons Foundation.